These last 2 weeks have been extremely hectic and chaotic. From getting together with family and friends to shopping and travelling – it feels like I’ve barely had a chance to breathe! And let’s not forget what comes hand in hand with so many activities – unhealthy eating! It’s just that time of the year when we seem to be surrounded by the Holiday Spirit as well as the indulgent food spirit 🙂 The number of desserts at a holiday dinner party sometimes rival the number of entrees! I find it extremely hard to say “no” all the time. Even though I don’t have much of a sweet tooth, it can be hard to resist. So what’s the next best thing to do? My motto is not to deny myself from my cravings, but rather to indulge in a single helping or a small portion of it, to help avoid binge-eating later on. But, even with that considered, I still feel sluggish! I suppose it’s a combination of all the late nights, the travelling, and the over-eating, which tells me that it’s time to get back to the normal routine. I start off by sleeping and waking up at normal times (getting 7-8 hours of sleep is extremely important), slowly but steadily increasing my workout hours, and making sure my diet is clean and healthy. Our bodies do a fantastic job of cleansing and detoxing by themselves, so the best thing we can do to feel healthier is to provide them with the right foods to enhance the process. Today’s recipe is one of my favorites. It has plenty of fiber, antioxidants and vitamins that our bodies need on a daily basis. Having this drink on busy days is especially helpful because it takes care of a lot of essentials, giving me a peace of mind. It is good for both digestive and heart health; plus there is the additional bonus of its inherent flexibility. Whatever veggies and fruits that you have at home will work. Be adventurous and experiment with different combinations! I’m not doing any juicing here, which ensures that valuable fiber stays intact. I can’t emphasize enough how many benefits this smoothie has – feel free to check out the nutritionals before trying it to see! 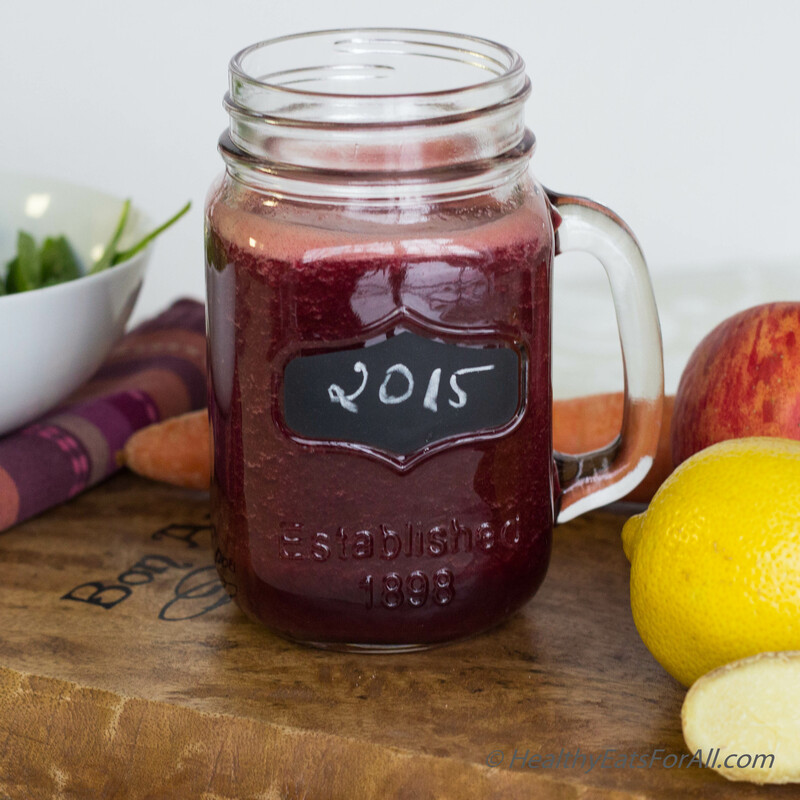 Let’s have this delicious drink to kick-start the New Year to a happier, healthier us! Wash the spinach and apple/pear. 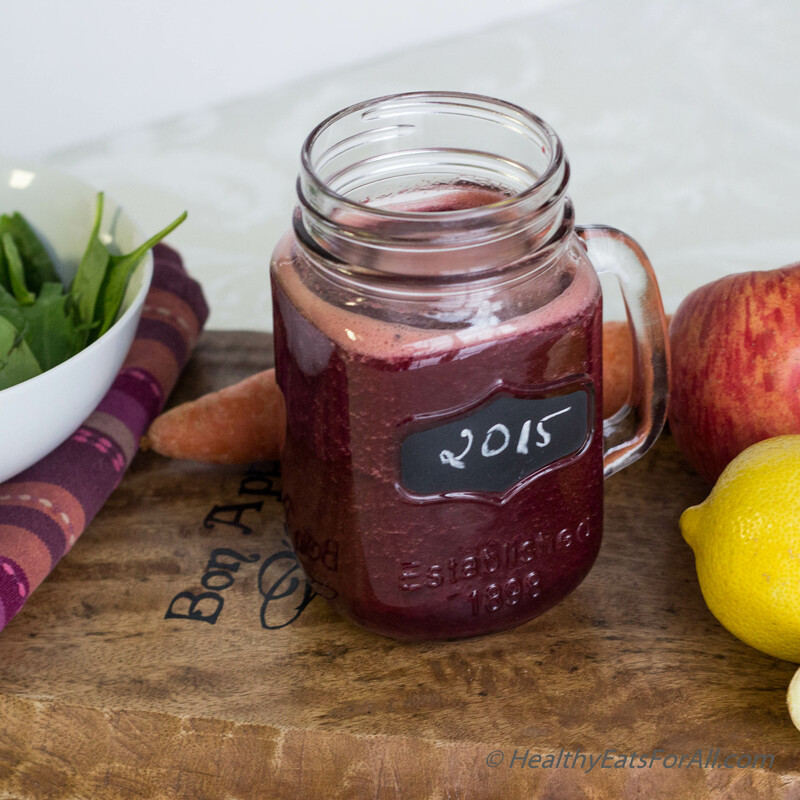 Peel the beetroot, carrot, kiwi and ginger. Add all above veggies and fruits to a blender or any other similar appliance like a Nutribullet or Vitamix etc. Add lemon juice and pink salt. Adjust seasoning according to taste and enjoy! Thanks for sharing the recipe.since you posted, I have been preparing this drink for my husband everyday and he loves it. I am so glad you like the recipe Shefali! Would love to try this. But I have a quick question. I am new to making veggie smoothies. 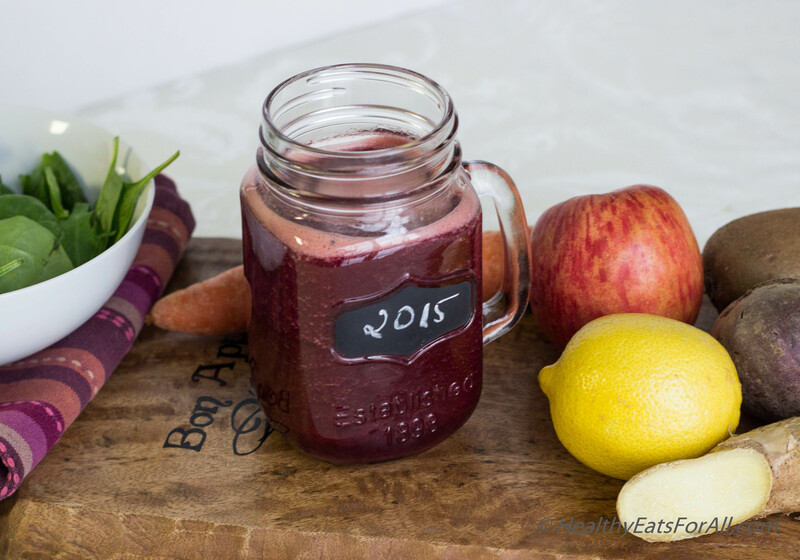 Are Beet root and carrots raw when placed in blender? Or should they be partially steamed?